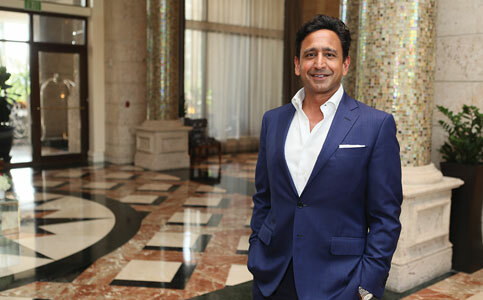 As president and COO of Hersha Hospitality Trust, Neil Shah manages a portfolio of 50 hotels totaling 7,666 rooms in South Florida, New York, Boston, Philadelphia, select West Coast markets and Washington, DC. Mr. Shah, who in 2006 took over his family’s business with his brother, CEO Jay Shah, has since 2000 led the acquisitions, development and asset management for the company, founded in 1984 by his parents, Hasu and Hersha Shah. The company’s total assets now stand at $2.6 billion – far beyond where it started with his parents’ purchase of the 24-room Red Rose Motel in the Pennsylvania countryside. Mr. Shah, then a recent Harvard Business School graduate, saw the world in the midst of the first tech boom. He decided the time was perfect to rejoin the company and expand its presence, including in South Florida. Hersha now operates six South Florida hotels – the Ritz-Carlton Coconut Grove, Residence Inn Miami Coconut Grove, the Winter Haven, Blue Moon Hotel, Cadillac Hotel & Beach Club and Parrot Key Hotel & Villas – and is developing a 147-room hotel in Coral Gables’ Merrick Park. Mr. Shah sat down with Miami Today reporter Jesse Scheckner at the Ritz-Carlton. The interview, recorded by Jahmoukie Dayle, can be found Friday at http://bit.ly/2uNHy0Q. I have been in the hospitality industry with Hilton Worldwide for the past 27 years and still counting…I have joined with honor the “Hersha Hospitality Group” and it has impressed me because Hersha definitely has “Added” the extra “Hospitality Seasoning” for today’s and future rewarding recipes of customer satisfaction to come:) Congrats, The Shah Family!